Picture this: You and your love are spending a romantic weekend in St. Augustine. After an incredible dinner, the two of you cozy up for a sunset carriage ride through our quaint, historic town. Or perhaps you go for a boat ride under the moon and stars. Does this sound like the kind of getaway you and your significant other need? Find out more about our favorite St. Augustine date ideas, many of which are within walking distance of the Agustin Inn Bed & Breakfast! Our free Vacation Guide is a great resource anytime you visit the oldest city in the U.S. Whether you’re looking for more St. Augustine date ideas, tours of the city, events, shops or restaurants, get access to this guide to make sure you’re in the know! Just a short stroll from our inn you’ll find the Spanish-inspired restaurant, Michael’s Tasting Room. The menu consists of dishes created using local and seasonal ingredients as well as an award-winning wine list. When you book your dinner reservation, be sure to ask them about their Date Night Experience. It begins with an amuse bouche and a toast of sparkling wine for two. Chef Lugo then serves up a three-course dinner accompanied by the perfect wine pairing. For your date night, why not tour historic downtown St. Augustine by way of a horse-drawn carriage? The staff at Southern Carriages will make you feel as if you’ve stepped into a fairytale as you ride through town in their lighted white carriage. You can bring your own bottle of wine or have them take care of the details for you. You can also book a carriage ride through us at the time of your reservation as one of our add-on attractions! Less than a mile stroll from the inn, you’ll find Schooner Freedom Charter. 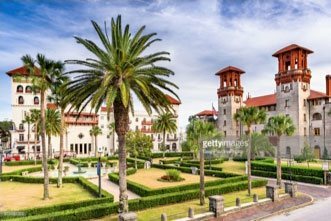 Because they have been rated as one of the Top 10 Attractions in St. Augustine by USA Today, you will want to add this to your date night to-do list. Each Friday evening, Schooner Freedom Charters offers a 1 hour and 15-minute moonlight cruise. While you sail, you’ll enjoy complimentary drinks and unbelievable views of the town. Reservations must be made in advance. Let us know upon booking your room at Agustin Inn if you’d like to add this to your reservation and we’ll take care of the rest! With 42 miles of shoreline, warm water, and white sand, spending some time at the beach is a must! If lounging on the sand all day isn’t your thing, why not check out Anastasia State Park? The park is located just 4 miles from our inn, so it’s close enough for an afternoon outing. If you love the outdoors, you’ll have a blast exploring the park’s 1,600 acres. Pack a picnic and plan to spend your time hiking, bird watching, beachcombing, boating, and biking. If you love to try new foods together, a local food tour just might be your thing. 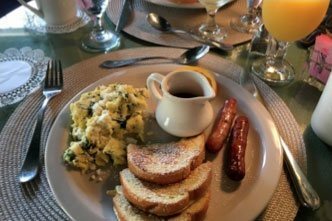 The St. Augustine Food Tour will have you feeling full and happy. This three-hour, all-inclusive tour stops at five participating restaurants. You’ll dine on four savory dishes and one dessert, and you are welcome to purchase beer and wine to pair with your meal. Tours begin at 1 p.m. and reservations are required. Let Us Pamper You With Our Ultimate Romance Package at Agustin Inn! No matter if you are celebrating a special occasion or just need some time to put a little spark back into your relationship, we have just the thing for you! 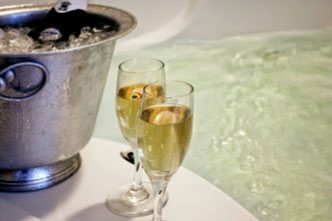 With our Ultimate Romance Package, you will receive a bottle of champagne, a dozen roses, six chocolate covered strawberries, and a flameless candle. We also offer couples our Classic Romance Package, which includes a half a dozen roses, six chocolate covered strawberries and a gift certificate to one of St. Augustine’s signature restaurants. On top of all of that, with both packages, you will receive a private carriage ride! 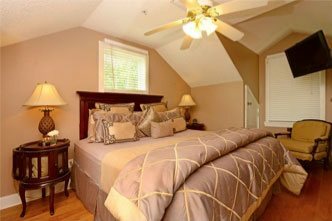 Our rooms are very elegant and inviting so you will be able to relax and get plenty of rest. We like to start each day with a delicious two-course breakfast. Come and see why guests return to our beautiful inn year after year. We’d love to welcome you at Agustin Inn for your romantic weekend soon.